From August 8- 12, experience the goodness of McCafe Premium Roast Coffee for free, just by simply presenting your “FREE COFFEE” coupon from 4:00 to 10:30 am at all McDonald’s breakfast stores nationwide. Watch out as these free coupons will be given away in offices, transportation terminals, colleges, universities and McDonald’s stores starting August 5. 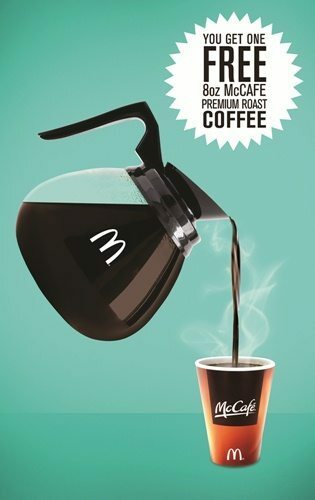 A delicious cup sure to make your mornings even better, McCafe Premium Roast Coffee is made from 100% pure Arabica beans. Handpicked from some of the world’s best coffee-producing regions, McCafe Premium Roast Coffee is roasted and blended to perfection for that flavorful aroma and great-tasting brew. Whether enjoyed alone or paired with your favorite McDonald’s breakfast items, it is the perfect cup to perk you up and add a little something extra to your day for only Php 25. Have your free McCafe Premium Roast Coffee any way you want – coupons can be redeemed through dine –in, take-out or even drive-thru. For complete mechanics and details, visit the McDonald’s Facebook fan page www.facebook.com/McDo.ph.